Cross Country is our Winter Athletics season. It is family orientated and we encourage and allow all members of the family to participate. We run and race on all types of tracks … through puddles, bush trails, mud and open grass and in all weather conditions. We participate in a number of team events, competition events and handicap races to add variety. To finish the season, we have a Championship race where all kids receive a medal or ribbon and a presentation night to cap off the season. Participation trophies are awarded to all children who have run a minimum of 8 events. We encourage all abilities and reward PB’s (personal bests). It’s not just how fast you run, it’s how much you can improve. Mondays & Wednesdays 4.30pm – 5.30pm @ Edwin Flack Reserve. Most events will be held in the grass areas surrounding Edwin Flack reserve, Manuka Rd, Berwick. To make things interesting, we also run in local park lands such as Cardinia Reservoir, Lysterfield lake, Akoonah Park and Aranmore lake. Or just because you love running and being active! New members, only $85.00 - covers all our costs of running the season, insurance, season end trophies and medals/ribbons on our Berwick championship event. What is little athletics? As the name suggests, it is based upon the sport of athletics (track and field and cross country running). There are a wide range of events from Sprints, Hurdles, Middle Distance, Race Walking, Relays, Shot Put, Discus, Javelin, Long Jump, Triple Jump, and High Jump. Events are modified to suit the age, developmental stage and ability of the children. Little Athletics is the "Foundation for all Sports" as all sports use the skills developed at Little Athletics. What age can my child attend little athletics? Children who will be between the ages of five (5) and fifteen (15) years on 31 December 2018 can register. If your child turns 5 after 31st December, they can join on or after their birthday. Unlike other sports, you can join athletics at any point through the season. What does little athletics cost? Just $170 per child for the entire year (October through to August). This includes both track & field (summer) and cross country (winter) seasons. Discounts apply to families with multiple children. What is Track and Field (summer) Season? Track and field season focuses on track events (running & hurdles at various distances) and field events (throwing and jumping). It starts the first week of October and finishes at the end of March (School Terms 4 & 1) and runs for approximately 20 weeks of various programs. What is Cross country (winter) Season? Cross country running is where children run between 750m and 3000m depending on their age, starting in April through to the end of August (School terms 2 & 3). The courses cover a variety of surfaces including grass, trails, open country, hills, flat ground and sometimes even a bit of mud. Cross country season is great to keep kids active during winter and build a solid fitness base. My child is not sporty, can they still attend? YES, children can join with any level of skill or fitness. Our emphasis is on Family, Fun & Fitness. Children are given plenty of encouragement to achieve personal bests (PB's). Little Athletics recognises that children vary widely in shape, size and athletic ability, and is one of few sports that successfully caters for all. We encourage everyone. Can my child try it before I register/pay? We encourage all children to trial athletics to see if they like it. All athletes are entitled to two (2) free sessions and if they wish to continue, can register after these sessions. When is Berwick little athletics on? Track & Field is either Saturday morning and sessions start warm ups at 8:15am and events at 8:30am sharp. Twilights start at 6.00pm sharp. The younger age groups will be given priority on Twilights. Where is little athletics held? 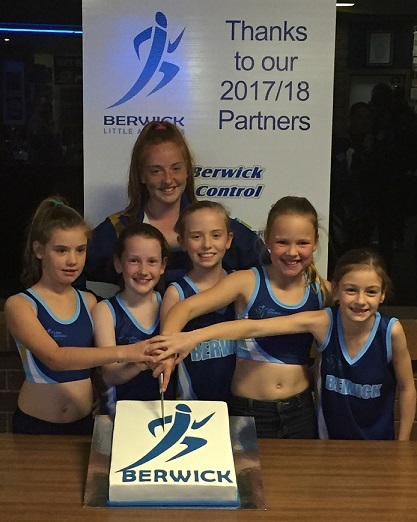 Berwick Little Athletics is conducted at Edwin Flack Reserve, Manuka Road Berwick. What do I need to bring? All you need to bring is your uniform, running shoes, water bottle, hat and sun cream. Does my child need to attend every week? While we encourage participation, attendance is optional. We understand families have other commitments and have no issues with children missing weeks, leaving early or arriving late. Does my child need a uniform? You don’t need a uniform to trial little aths. Once you are registered, you are expected to wear a uniform. When is training? Training will be held every week and is optional. More details click on the training tab.